Yesterday I was contacted by italian photographer Paul de Grauve (http://pauldegrauve.org/). He asked me if he could use my track “New World” for his video about the Vivienne Westwood Fashion show at the Milan Fashion week for his online magazine Modeyes (http://www.modeyes.com/?p=19891). I gladly allowed the usage of the track. I like to work together with creative people. Have a look at the result of his interview and videowork and my “New World” track below. Keep up the good work Paul ! Took me some time again, but here is my 2012-2013 mini album, also available on SoundCloud. My new year present for you ! Feel free to share and download ! Streaming 4 sequenced free VST instruments into a “loop” created by two good old reel to reel recorders. It actually sounded like avantgarde music, even used some of the technique to create it. I have a lot on my mind lately … perhaps a bit too much. So when I was fiddling with some buttons, knobs, sliders and the like, this sound – called “Thoughts” – came up. Brain therapy perhaps ? At last I can announce the official digital release of the “2010 – 2011 EP” mini-album. 2010 went by so fast, while I had (and still have actually) so much work to get done. And on top of all. Some code in the backend of my site went bezerk. 99% is already working again, some facebook and other social network links are still acting a bit funny (funky even), but I’ll sort it out in the background. Normally I make a few tracks to be released around XMAS, this year, there was no way to reach this deadline. A lot of reasons, but mainly : lack of time / dismantled studio. But it felt awkward, I just HAD to make something. Even when I couldn’t release them in time. In less than 3 days of time I had, I made these 4 tracks, to be combined to the new mini-album “2010 – 2011 EP”. You can find the 4 tracks and the complete digital release album available for free download (containing the tracks, playlist file and artwork) on my music page : http://www.junonoel.com/music/#2011-01.1. Everybody knows the Amen Break(beat). It’s old, from 1969, and still up to date. Thanks to cutting/pasting/rearranging the beats on turntables / tape recorders and more recent samplers and computers this break started a quest for new beats in rap/hiphop and later on electronic music like techno, jungle / drum ‘n bass (and probably a very long list of other genres). It’s been a while that I posted an update. The warm lush sound of a “stringer” synth. If you have ever listened to Jean-Michel Jarre’s Oxygene or Equinox, you’d instant recognise the sound. 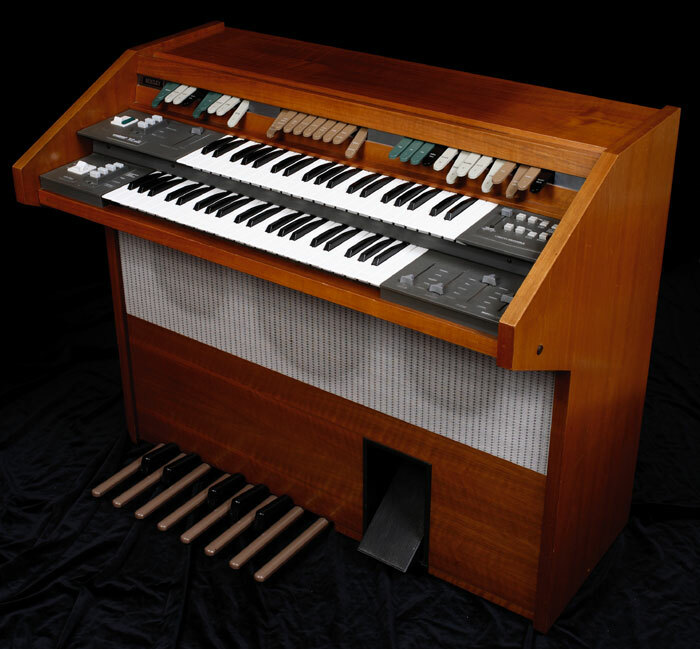 Originally, Jarre didn’t really use a synthesizer for this sound though, it was an organ, the Eminent 310 with a string patch. When fed through a phaser: instant lush sound was there. Later came the smaller ARP – Solina String Machine, which could produce the same style of sound. 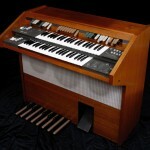 But still, these two organ / synth’s were quite big and are getting rare these days, if they even still can work. These things are already from the early 70-ies ! 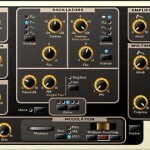 When looking around for nice free goodies, I stumbled upon AlgoMusic’s StringSynth. Not a rompler or sample based instrument, like most of these (free) emulators of the old string synthesizers. Is it an exact copy ? Probably not, but you can get it to produce very nice sounds, that really come close to these big old huge beasts. And it’s free ! The interface is clean, simple and compact. It’s easy to edit and not too small to have a clear view of the thing. Only possible negative side to it, might be CPU usage, which can get sometimes pretty high when using multiple instances with a lot of polyphony. To give you an idea what it can sound like, click on the play button below. It’s a little demo with 2 instances of the stringsynth VST. Just a little track made in Renoise and 7 instances of the acidrack VST that I posted earlier about. All sounds are made by this little synth. I could probably do a lot more with it, but I just had a quick try and play with the instances for about 30 minutes, including making the little demo track. Sure it isn’t a Roland TR-808 / TR-909 if it’s about the percussion. Yet again, you can get some decent drum sounds out of it, especially some bassdrums if you take the time to tweak it a bit further. But it’s sure you can make some nice basses, leads and even some decent strings with this toy. As said in previous posting, I’m looking around what’s available free on the VST market. VST plugins are virtual software synthesizers or effects to be used in real-time with your favorite VST capable sequencer / DAW. Since I’m in the proces of a complete reinstall, why not have a look at all these plugins again ? There are some amazing synths out there. One of those is acid.milch&honig acidrack. Sometimes it’s a pity to see an amazing plugin that offers great technical capabilities, but the user interface is just … well, no very useable. Too crowded, colours that hurt your eyes, too small, not intuitive. On the other hand, there are loads of synths or effects with a very nice almost “I-can-grab-it-right-from-the-screen” interface, but that lack decent processing or are heavy like hell for your computer. So far, I’m really impressed in both the clean interface and technical / sound capabilities of the acid.milch&honig acidrack VST synth. It’s a 2 oscillator virtual analog synthesizer, with some nice filter/LFO capabilities. Sure, there are a million in a dozen of these VA synths around. But this one is so intuitive and totally free, you’d be nuts not to give it a try. A lot of the synthedit synths (a program to visually make your own VST plugins, without needing knowledge of for example C++ code) are automatically ditched by a lot of VST users, because of a lack in decent sound/useability. But this little plugin shows it can be done right. I think I’m gonna have a lot of fun with this lil toy. I’ll try to post some sounds later.